Starmart Express established and started its bus service operation in year 1989. The office is headquartered in Taiping, Perak. 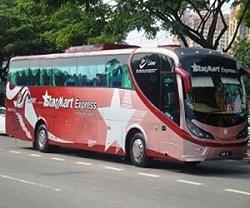 Starmart Express offers daily express bus services across Peninsular Malaysia and Singapore. It offers bus routes from Malaysia and Singapore to various popular destinations within Peninsular Malaysia including Ipoh, Malacca, Kuala Kangsar, Kampar, Pagoh, Gopeng, Kluang, Chemor, and more. 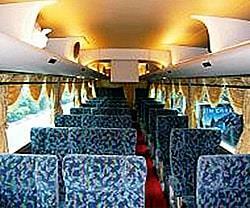 Most popular bus route is bus from Singapore to Kuala Lumpur, Singapore to Penang, Singapore to Malacca, Singapore to Ipoh and many more. Starmart Express deployed mainly single-deck bus with 27 seats. To provide the best service for its customers, Starmart Express buses are fully equipped with air-conditioning, spacious leg-room, and comfort reclining seats. In addition, the buses operated by Starmart Express also have spacious undercarriage luggage compartment to cater for the large and extra baggage. More importantly, Starmart Express is well-known in providing the most reliable and efficient service to their customers. All drivers from Starmart Express are well-trained and experienced to ensure your bus journey is comfortable and secure. With Starmart Express joining BusOnlineTicket.com, you can now book Starmart Express bus ticket online in anywhere, any place, and anytime! No. 10, Jalan Medan Simpang, Medan Simpang, 34700 Simpang, Taiping.